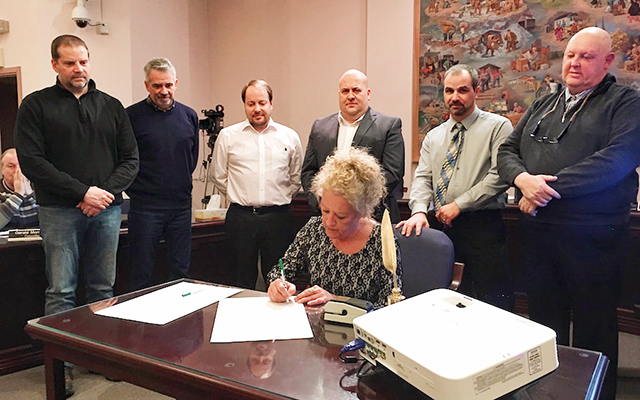 Municipal officials from Madawaska and Edmundston, New Brunswick, on Tuesday, Jan. 23, signed a joint resolution expressing their expectations regarding a pending project to upgrade the international bridge that connects the two communities and the related border crossing facilities. EDMUNDSTON, New Brunswick — Municipal officials from Madawaska and Edmundston, New Brunswick, on Tuesday, Jan. 23, signed a joint resolution expressing their expectations regarding a pending project to upgrade the international bridge that connects the two communities and the related border crossing facilities. “The joint resolution demonstrates how important the international bridge is to both communities. This is the first time that our two communities have taken a step like this,” Madawaska Board of Selectmen Chair Brian Thibeault said. The bridge, built in 1921, has seen better days. Heavy commercial traffic on the existing bridge was halted in October when authorities imposed a reduced weight restriction of five tons, due to concerns about structural integrity. The bridge project already had been in the works, but the new safety concerns may hasten the timeline for the project. Civic leaders plan to forward the resolution to the Maine and New Brunswick agencies tasked with sighting and designing the new bridge. The Maine Department of Transportation considered a number of options to address the aging bridge, including renovating the existing span, building a new one at the same downtown location or constructing a new span further downriver. According to Ted Talbot, press secretary for the MDOT, the department evaluated rehabilitating the existing structure, but now prefers replacement. 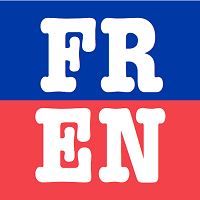 The resolution language calls for locating a new span connecting the two communities’ “municipal business districts,” to maintain and strengthen economic ties. The one-page resolution does not include suggestions on how to address the issues of commercial truck traffic through the downtown areas. The resolution also calls for a new bridge design that posses “landmark aesthetic qualities” that acknowledge the region’s history and culture. “It was important for us to come together to align our expectations in terms of the future international bridge,” Edmundston Mayor Cyrille Simard said. Last summer, MDOT officials said the timeline for any international bridge project in Madawaska would vary depending on the extent of the final design. Simply rehabilitating the current bridge could take three to five years. Replacing the bridge could take as little as six years or as long as 15, depending on its new location. The representatives from the Edmundston municipal council and Madawaska board of selectmen agreed the replacement of the international bridge is an urgent priority. “It’s an historic day and proud moment for both communities of Madawaska and Edmundston to be working collaboratively on future projects and in regards to the international bridge,” Thibeault said. Maine and New Brunswick transportation officials are expected to unveil preliminary plans for the bridge, including a proposed location for a new span, at two upcoming public meetings. Both will be on Jan. 31, with the first at 5:30 p.m. (Atlantic Standard Time) at Palais des Congres in Edmundston, and the second at 7 p.m. (Eastern Standard Time) at the Madawaska High School cafeteria.